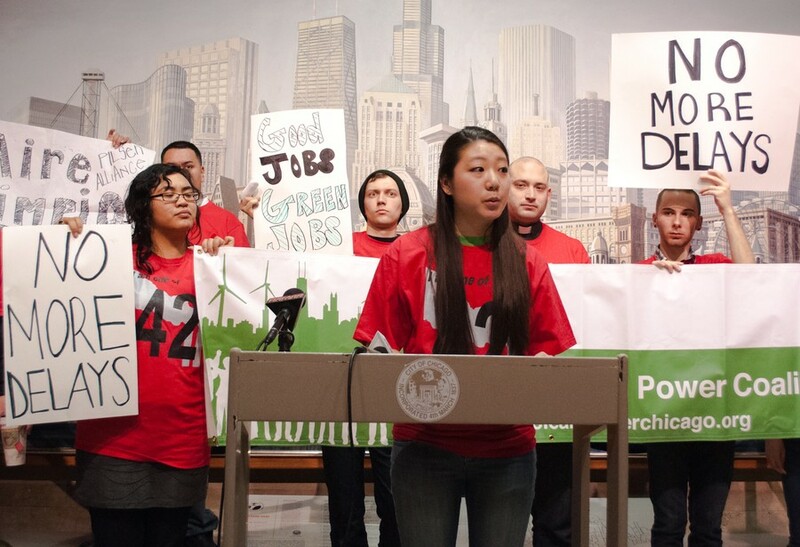 Members of the student group University of Chicago Climate Action Network (UCAN) joined environmental organizations from across the city at a press conference outside City Hall on Wednesday. They called on Mayor Rahm Emanuel to close two coal plants they say are polluting Chicago air and causing health hazards for residents. The students joined representatives from the Pilsen Alliance, Chicago Respiratory Health Association, and the Southside Steelworkers Union to urge Emanuel to fulfill a campaign promise and close the Fisk and Crawford coal plants. Air pollution from the Fisk and Crawford plants causes 42 deaths, 720 asthma attacks, and 66 heart attacks each year, according to a September 2010 study conducted by the environmental non-profit organization Clean Air Task Force. The coalition also voiced support for the Clean Power Ordinance, a piece of City Council legislation to reduce pollution in the city. The ordinance has garnered the support of 35 of the council’s 50 aldermen, including aldermen Will Burns, Leslie Hairston, and Willie Cochran from the Fourth, Fifth, and 20th Wards, respectively. “I am part of a generation who will have to deal with the lasting consequences of inaction,” UCAN Assistant Director and second-year Grace Pai said in her prepared remarks. Members of the Chicago Clean Power Coalition, which UCAN is part of, selected Pai to speak at the press conference because they wanted to give a student voice to the issue. UCAN member and second-year Edward Warden said that he used to drive by the coal plants with his mother every day when he was younger, but never recognized their environmental impact. “When I was younger, I wasn’t aware of the amount of pollution they created. Now I am upset by the sheer amount of pollution the city of Chicago creates. It’s time for Chicago to move off of coal,” Warden, who is also the director of the RSO Green Campus Initiative, said. Immediately after the press conference, supporters of the Clean Power Ordinance went to the viewing area during an ongoing City Council meeting to get the mayor’s attention. During the meeting, 25th Ward Alderman Daniel Solis, who re-introduced the Clean Power Ordinance last year, praised the activists for their efforts to pressure City Hall to pass the law. Emanuel, who usually presides over City Council meetings, was not in the chamber during Solis’s remarks.